Copyright © 2011-2018, JM Marine Survey. All rights reserved. Information correct at time of last website update, but subject to change without notice. 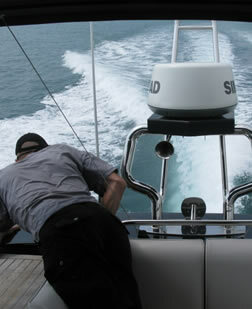 Buying a secondhand boat can be a tricky business. As with cars and houses, sellers often go to considerable lengths to disguise defects and create a good impression pre-sale. But more often than not, owners are completely unaware of underlying issues. Are there indicators of osmotic blistering, impact damage or rot? Have skin-fittings dezincified, or corroded to the point of collapse? Are structural components eaten out by termites? Few system failures occur out of the blue: many are the result of slow degradation or inadequate maintenance. A good marine surveyor knows where to look for these signs and can advise on how to rectify the problem and how urgently it should be addressed. Is your dream yacht really such a good buy? Or should you renegotiate the price? 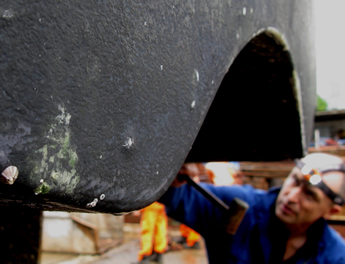 Even brand new boats have their problems, as our commissioning surveys demonstrate. Delivering a new sailing yacht from the Florida factory to the Caribbean some years ago, we compiled a defect list two pages long within several hours of going to sea. Some defects were serious enough to keep the yacht in port for weeks while the owners battled with the manufacturer over warranty. Unfortunately this is not unusual. Factory faults and equipment issues are normally identified only when the vessel is surveyed for a purchaser, long after warranty has expired. A condition survey for the original owner carried out prior to the end of the warranty period is often a prudent investment, with the survey fee recouped many times over. 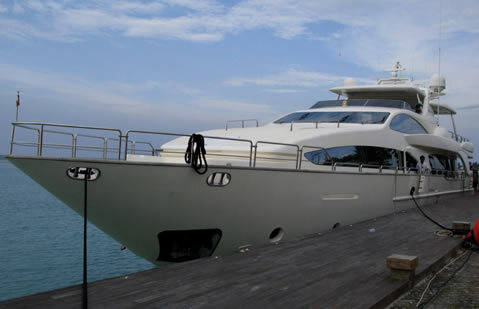 In the hot damp climate of Singapore and SE Asia, a fibreglass hull (whether on a superyacht, a sailing catamaran or a sports boat) is vulnerable to accelerated hydrolysis and osmotic blistering. Lightning damage is common. High temperatures and humidity speed up the corrosion of metal fittings above and below the waterline, not least in the engine room. 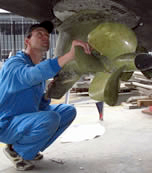 Skin-fittings and through-hull assemblies are adversely affected and have the potential to sink a boat, even in the marina berth. While it’s the yacht broker’s job to focus on the good aspects of a vessel (and no one can blame them for doing their job); the reality is that all boats have defects. The important thing is to make sure that these are small and inexpensive to rectify, or that they won’t interfere with your boating plans. Your time on the water should be enjoyable - so if a prospective purchase needs a lengthy stint in a shipyard to make it safe, reliable and hassle-free, it’s good to know this before you proceed.